Ready to land at the next station ?! FamouStation Event is part of the events managed by WedoSL! We're very happy and excited about this new partnership! Because it's outcome of the desire of all to make this event even better. We hope that only good fruits can be born of this union, 'cause we're working hard for it! Ok, let´s get to the point! This city is known by many people as the capital of designer and fashion, and It attracts the world by his divine architecture, cuisine and the events it hosts. Our designers, attracted and inspired by this incredible city, are preparing a selection of wonderful items for you. Stay tuned! Don't miss the trip! We will be waiting for you guys! 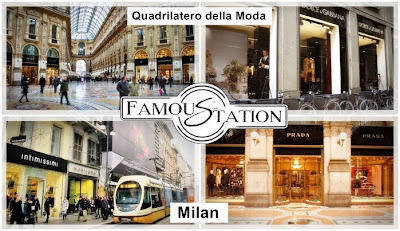 [•] Let's say some words about our destination station, Milan. Milan is a wonderful city! It unites harmoniously its rich cultural and architectural past with the status of a modern and cosmopolitan metropolis in Italy. For designers and fashion lovers, Milan is considered an enchanted kingdom. The architecture of the old and well-maintained buildings, with modern inside is stunning! And area known as Quadrilatero della Moda is called the sacred temple of this fashion kingdom. It is a set of streets where the most chic and expensive brands in the world vie for the attention of passersby. However, there you can find all kinds of shops with prices of most varied too. One of the things that draws people, after the famous brands shops, are the display windows ... always wonderful, they make many people spend hours walking through this place admiring each one. It's a fantastic place to shop. [•] Just some photos for inspire you!